As account or user administrator you can add an unlimited number of other users to your account without losing control over them. You determine yourself what a user can or cannot do by determining specific rights and roles per user. Once a user has been created, they will be able to sign in using their personal email address and password. There is no extra charge for adding additional users to your account. This is completely free! Click on to add a new user. 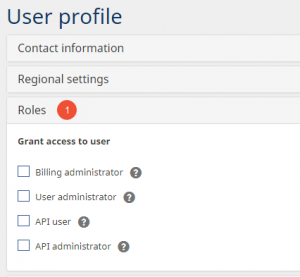 Fill in the User profile and determine the roles, rights and permissions (see further down). Enter your CheckMarket password and click on Save. The person you have added will automatically receive an email with a link to create their personal password. After setting their password, they can immediately start using the tool. Billing administrator: the user can view and manage the billing details of your account. They can view and pay all invoices and change the billing model. User administrator: the user can add, edit or delete other users. API user: the user has access to the CheckMarket API and can administer their personal API keys. API administrator: the user has access to the CheckMarket API and can administer both their personal API keys, as well as your Account key. 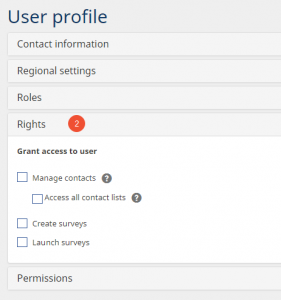 Manage contacts: the user can manage contacts in surveys and access contact lists. Both options are limited to the surveys and contact lists they have access to. Access all contact lists: the user has access to all contact lists in your account. They will automatically have access to any new contact list that is created. If you do not give access here, you can still give a user access to a specific list from the list itself. 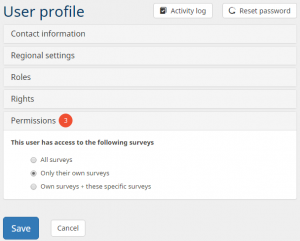 Create surveys: the user can create new surveys in CheckMarket. Launch surveys: the user can launch all surveys they have access to. All surveys: the user has access to all surveys in your account. Only their own surveys: the user can only access the surveys they create themselves. Only their own surveys + these specific surveys: the user has access to the surveys they create, as well as the surveys you select in the menu that will appear after selecting this option. Click on the Actions button in front of the user you want to delete and then select Delete. (1) Select the user who will become the new owner of all their surveys. Why should we use a unique login for each user?